Almost everyone shopping for a car wants something for nothing. When it comes to lining up the financing, most buyers shoot for the zero percent interest loans. However, not everyone will qualify and those that do might be leaving money on the table. 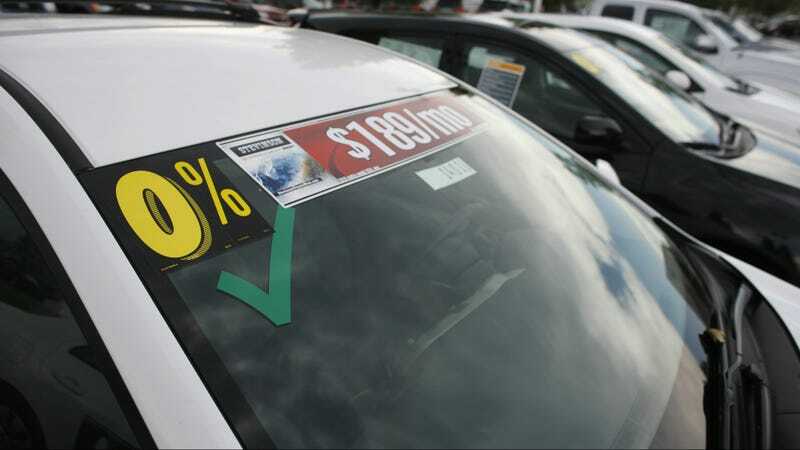 According to a report complied by the Associated Press, zero percent loans are gaining in popularity, but some car buyers that are taking advantage of them are not getting the best deal. It used to be that if you had a 700 FICO score you would get the lowest rates possible. That has changed in the last few years and it has become a little harder to qualify for the zero percent. According to Experian, new-car buyers who obtained interest rates of 1 percent or less had an average credit score of 754. For reference, that’s considered “prime” credit; “super prime” scores go all the way up to 850. The average credit score for a new car buyer in the first quarter was 713, and the average interest rate was 4.7 percent. I can’t stress enough getting pre-approved for financing before arriving at the dealership, even if you have good credit. I had a recent client who didn’t follow this advice, and just assumed the dealer would give him the best rate. He needed a car immediately and was shopping on the last day of the month. Even with his credit score of 770, the lowest rate he was offered on a CPO Toyota was 3.9 percent. Had he been pre-approved through a local bank, credit union, or credit card, he probably could have done a little better. A lot of consumers don’t know that you can re-finance auto loans later at a lower rate. This usually doesn’t cost you anything, but just make sure you are not extending your term. For example if you refinance a 60 month loan two years in, only roll that over into a 36 month term. Is It offered on the car you want? Even if you do have an 800 FICO that doesn’t automatically mean you will get interest free financing. It all depends on the manufacturer. If the brand you are shopping isn’t offering it, then it’s not available. This may sound obvious, but I’ve encountered quite a few folks demanding that they get zero percent from an automaker that never has that kind of deal. Remember that zero percent financing is part of an advertising blitz to get people into the showroom so they can clear out their inventory. For example, right now Chevrolet is offering zero percent financing for 72 months on “most” cars. Looks like I can finally afford the payments on that Z06! Not so fast, as you need to always take a look at the fine print. 1. Monthly payment is $13.89 for every $1,000 you finance. Example down payment: 8.7%. Must finance through GM Financial or Wells Fargo. Some customers will not qualify. Not compatible with lease and some other offers. Excludes Cruze and Equinox L models, Corvette, Colorado, Suburban, and Tahoe. Take delivery by 8/10/15. See dealer for details. Hey wait, the Cruze and the Equinox don’t qualify, but those cars are in the picture! Okay fine, I’ll have a look at the Malibu. I rented one once, it seemed like a decent car. Maybe you are shopping for a mid-size sedan. This is a very crowded segment with several qualify offerings. Some of which are clearly better than others. What a lot of buyers don’t consider is the total cost of ownership. You may be tempted to pick up a 2015 Malibu LS for only $292/mo with $2,329 down if you qualify for the 0 percent on a 72-month loan. Or you can have an Accord LX with an MSRP of $23,725. Honda is offering 0.9 percent for 60 months or 1.9 percent at 72 months. With the same down payment of $2,329, you would finance $21,396 for a monthly payment of $314/mo on 72-month loan. So the Honda will cost you an extra $1584 over the course of the loan. The Honda comes out on top even if you pay $1584 more for your financing, you are still about $1250 ahead of the Chevy when you factor in the big depreciation difference. Maybe you don’t care about any of that. You like the Malibu better and Chevy is throwing $1500 consumer cash to sweeten the deal. Do you take the rebate or the zero percent? It would be great if you could have both the $1500 rebate and the zero percent APR, but Chevy clearly states that the consumer cash cannot be combined with the financing. If you were to finance the Malibu LS with an MSRP of $23,290 with no down payment for 72 months at zero percent, your payment would be $323.47/mo. If you took the $1500 cash and qualified for 1.9 percent for 72 months, your payment would be $320.46/mo. Although, if you didn’t get that low APR for 72 months and instead got 3 percent, the payment would jump to $331/mo. In that case you are better off forgoing the cash and taking the zero percent deal. Just because an automaker is blowing out the end of model year units with zero percent financing doesn’t mean it’s the best deal, or even the best car. Get pre-approved, do your research, compare other vehicles, and bust out that calculator to run the numbers before going into the showroom.